The DCI Proteomics and Metabolomics Shared Resource (DPMSR) provides qualitative and quantitative proteomic and metabolomic support using ultraperformance liquid chromatographs coupled to tandem mass spectrometers (LC-MS/MS). With its diverse set of capabilities the Resource can support a wide range of basic science experiments, and with its capacity the Resource can support clinical studies. The Resource provides researchers access to $5 million in instrumentation and a staff of eight scientists (four PhD) with more than 100 years of mass spectrometry experience. Located in the Levine Science Research Center in the heart of Duke's biomedical research campus, the 1,900 sq. ft. Facility is convenient to members of the Duke Cancer Institute (DCI). Created in 2007 as a proteomics resource, in 2013, the lab expanded its LC/MS/MS services to include qualitative and quantitative metabolite characterization. In recognition of this change, the Facility is now the Duke Proteomics and Metabolomics Facility. Since becoming fully operational in 2008, the Facility has performed more than 1,000 projects for over 150 PIs. While the Facility is available for use by the entire Duke research community, its CCSG support means that DCI members have priority access and are the first invited to be involved in early-access technology development projects. Integral to the Resource's ability to provide affordable emerging technologies to the DCI are close working relationships with instrument/software/reagent companies. One example of such a collaboration is with the manufacturer of the majority of our LC and MS tools Waters Corporation, for which the Resource is a formal Center of Innovation. This association allows access to emerging technologies (such as the IonKey microfluidics LC platform and DESI Imaging Mass Spectrometry), and software platforms (Progenesis software). The DPMSR operational model is to serve as a collaborative, customer-focused "Force Amplifier" for biomedical research; offering interactive, efficient, and cost-effective state-of-the-art proteomics technologies. Qualitative and quantitative metabolomics analyses using four panels of assays (two targeted panels targeting over 300 individual metabolites and two open ('omic) panels covering polar metabolites and lipids), thus providing fundamental biological information complementary to proteomics for basic science and clinical research programs. On-site consultation with PhD-level scientific staff to enable collaborative creation of custom experimental designs that meet scientific needs. Website providing detailed information about the Resource, scientists, services available, exemplar protocols, and educational information. 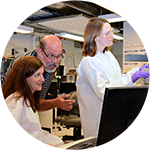 The Proteomics Facility uses the GCB Express Data Repository for data distribution and analysis for major projects. "Express" has been developed by GCB programmers to ease data production activities in the cores and provide a true repository for data of abiding scientific interest. The system has been used to automate data storage and analysis, and it is being expanded to increase its flexibility and capability. Prior to submitting a sample, please arrange for a consultation with Arthur Moseley, Will Thompson, or Erik Soderblom. Please note: Samples will not be accepted without prior consultation. Prioritization will be given to time-sensitive projects, including preliminary data needed for timely grant submissions and additional experiments needed for resubmission of manuscripts. Sample submission and data return from the Duke Proteomics and Metabolomics Shared Resource takes advantage of the GCB data repository to return customer data in digital format. This submission and data return protocol uses a single sign-on system, which can be accessed by both Duke and non-Duke collaborators. For details please visit: Proteomics Samples Submissions. For current pricing information, please visit: Proteomics.